Mechano Growth Factor (MGF) also known as IGF-1Ec is a growth factor/repair factor that is derived from exercised or damaged muscle tissue. It's called MGF as IGF-IEa is a bit of a mouthful and harder to identify amongst the other IGF variants. What makes MGF special is its' unique role in muscle growth. MGF has the ability to cause wasted tissue to grow and improve by activating muscle stem cells and increasing the upregulation of protein synthesis, this unique ability can rapidly improve recovery and speed up muscle growth. 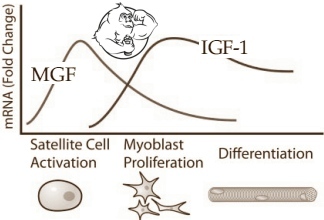 MGF can initiate muscle satellite (stem) cell activation in addition to its IGF-1 receptor domain which, in turn, increases protein synthesis turnover; therefore, if used correctly it can improve muscle mass over time. When you train, what happens to your muscles is they break down, the cells are damaged, muscle tissue needs to be repaired and your body produces 2 forms of MGF splice variant. The first initial release of the above mentioned number 1 variant from the liver helps muscle cell recovery, if there is no MGF then muscle cells die. As muscle is a post-mitotic tissue and as such cell replacement is not a means of tissue repair, if the cells are not repaired they die and your muscles get smaller and weaker. In muscle tissue, the pool of these stem cells is apparently replenished by the action of MGF, which is produced as a pulse following damage. Now, with synthetic injections of MGF you can increase the pulse and so speed up recovery, and increase the muscle tissue cells by stimulating satellite cells into full maturity. In terms of dosages, 200mcg bi-laterally is the very best choice of dosing in muscles trained. The only problem with MGF, and this is the reason I don't like it, is that it has such a short half life, just a few minutes, between 5-7, and it needs to be used immediately post workout as it wont work if muscle tissue hasn’t been damaged. That's why, for me personally, I think the best option is PEG MGF. Nevertheless, MGF has a huge role to play, and is administered to those with muscle wasting diseases and for those who are elderly and have lost muscle mass for good reason, it is EXTREMELY anabolic. What is PEG MGF (pegylated mechano growth factor)? MGF that's pegylated, which means it has the addition of Polyethylene glycol - a non toxic additive that increased the half life of MGF from minutes to hours. This means its uses and versatility make it a tremendous addition to a bodybuilders arsenal. I have found it most effective, as its effects are systematic, that means they have a whole body effect wherever muscle has been damaged or is diseased. When your muscle is damaged, your body releases a pulse of an MGF splice variant as I outlined above, followed by a less anabolic longer acting version from the liver. Therefore, it seems a waste to inject MGF at this time as you will just blunt your body’s own release, your not enhancing it. So using PEG MGF on non workout days is actually the best route. Since the muscle has been damaged, there are plenty of receptors for MGF, and the effects are systematic. All muscles will be aided in recovery through increased nitrogen retention, protein turnover, and satellite cell activation. Recovery is just going to sky rocket. Doing this means you're increasing the length of your body’s own mechanism for muscle repair and growth, and you're opening up the anabolic window. NOW PLEASE TAKE CAREFUL NOTES. Running PEG MGF in synergy with IGF is perfect but there are things you need to know. Since IGF has such strong receptor affinity, if you dose them at the same time, the effectiveness of MGF will just be wasted, at least on paper (the science supports this claim). However, further trials that I, and others, have conducted leads this to being inconclusive. IGF DES on workout days Pre-workout, or IGF1-LR3, this wont blunt your body’s own MGF release from the liver. Whereas IGF1-LR3 has a more systematic effect and only a very small localized anabolic effect, DES on the other hand is very anabolic in a localized way. Therefore, bring up lagging muscle parts with DES, and then the following day Dose MGF at 200-400mcg subq to increase recovery and the mechanism for growth. Perfect synergy. Over a 4 week run, I noticed about 4lb increase with the PEG MGF and LR3 partnership, and roughly the same weight in fat loss, very impressive. Though, some of my clients have noted far greater increases in muscle mass. If you're on a steroid cycle, there is no need for the addition of DES as IGF levels will already be elevated; you're better off with MGF, PEG MGF can take your recovery and gains to a new level. MGF and IGF-1 LR3 can be used as a bridge between steroid cycles and during PCT to prevent muscle loss and speed up recovery. Dosing 3 times a week as suggested above, and 1ml of BA water for every 2mg is optimal. Storage in the fridge for up to 6 months. Avoid exposure to heat or sunlight.